As a small (but mighty) team, we rely on the contributions of paid interns to accomplish our work. This week, we’re excited to welcome our new Council intern, Shara! Shara just wrapped her third year at Metropolitan State University, where she is pursuing a Bachelor of Arts in Public Relations with a minor in Ethnic Studies. 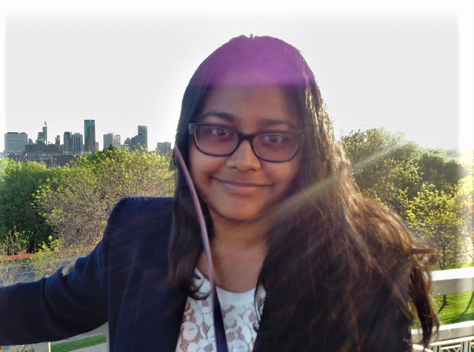 Originally from Dhaka, Bangladesh, Shara and her family immigrated to St. Paul 18 years ago. When Shara isn’t working with donor and nonprofit partners at the Council, she’s selling yummy Italian pastries at Cosetta’s. To learn more about our newest team member, we sat down with Shara to talk internship goals, hobbies, and plans for the future. Keep reading to see what she had to say. What excites you about interning at Charities Review Council this summer? I recently wrapped an internship with the Minnesota Historical Society, where I learned a lot about nonprofit development and fundraising. Transitioning to the Council, I’m excited to learn even more about nonprofit operations and best practices. I look forward to soaking up whatever I can from the Council team, who have years of experience in the sector. Learning about the inner-workings of the Council, while also learning about the organizations we partner with, is a dream come true. As a young professional interning at a small organization, I look forward to jumping in and making a real impact. How have you seen nonprofits show up in your community? Time and time again, I’ve observed the crucial role nonprofits play in our communities. In my recent experience with the Minnesota Historical Society, I got to witness first-hand the impact of strong programming and services as I watched students interact with exhibits for the first time. Seeing how excited students were to learn about history, reminded me that nonprofits harbor a lot of strength in our community. Do you have a favorite nonprofit or cause? Just recently I stumbled upon a nonprofit in Bangladesh called Adhunika. The word translates to “modern” in English. I was drawn to Adhunika because the work is centered in the empowerment of Bangladeshi women. I hold a lot of the values Adhunika stands for very near and dear to my heart. When you’re not connecting with donors and nonprofits at the Council, what do you like to do for fun? I just bought a Nikon camera and have enjoyed taking photos of nature and food. I also love checking out new restaurants. What is your go-to restaurant right now? I love supporting local restaurants. Some of my favorites include Fasika Ethiopian Restaurant, J Selby’s, and Naf Naf Grill. One of my goals has been to try all the restaurants along University Avenue… I’ve got a long ways to go. Happily accepting any recommendations you might have! We’re thrilled to have Shara with us this summer! Join us in welcoming Shara to the Council team by sending a quick note (and restaurant recommendation perhaps?) to shara@smartgivers.org.